After Aussie group Wolfmother released their self-titled debut in 2005, there has been no stopping them. A�Not only were they different in the way they sounded, but they reminded rock enthusiasts of classic rock bands like Led Zeppelin and The Who. The album helped them win the J Award in 2005 (given by an Australian radio station) and the ARIA (Australian Recording Industry Association Music Awards) in 2006 for best breakthrough album and best rock album. The band also took home a Grammy Award for their hit single Woman, in the Best Hard Rock Performance category (2006). Having played countless venues and festivals across the globe, they are finally hitting India, courtesy VH1 India, where a three city tour is scheduled. 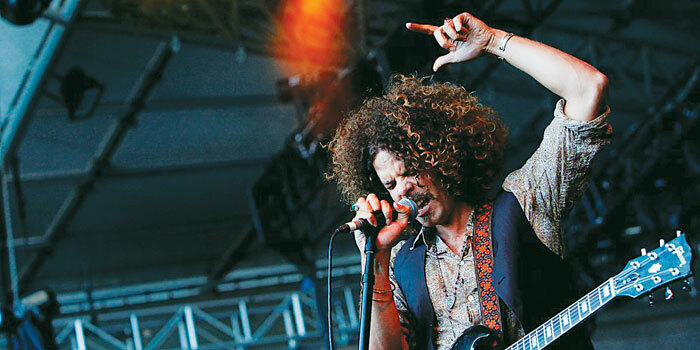 We catch up with frontman Andrew Stockdale, who shares his views about the gig, on choosing the name Wolfmother and winning the Grammy Awards. We wanted to tour India because we believe in trying new things and since we have a huge fan based in India, we wanted to give it a shot. We are looking at doing our best and having fun at the same time. Ita��s also the land where Gorge Harrison dedicated his life to the sitar, and gained more knowledge about music as an art form. And with the amount of bands touring India, I think it gives out a good vibe to people across the globe. Our former bass guitarist came up with our name before we got our first show and I was thinking, a�?What the hell is that, it sounds like a death metal band, are you serious?a�� He got it out of a book called Skinny Legs and All by Tom Robbins. Since no one came up with a name, we had no choice but to stick with it. I just love it now. Collaborating with (guitarist) Slash was fun, we were recording our second album (Cosmic Egg) at the time and Slash came down to the studio and asked me if I would be interested in doing the number, By The Sword, with him. We figured out the parts together and the next thing you know, it was a number one hit single. Rock music is a survivor, it has a lot of emotional content. EDM has surfaced recently and cana��t be compared with this genre. We have played at all venues possible, and the response of the fans is crazy. Rock music had its challenges, but ita��s here to stay.